← From conception to reality – how to 3D print. 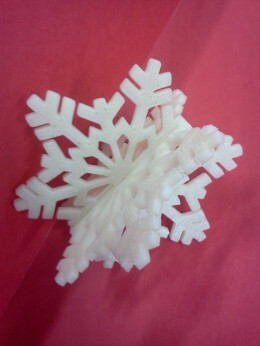 The first printed snowflake of the festive season. We’re hoping it will be joined by many more. We’ve used the snowflake pattern on Thingiverse :: http://www.thingiverse.com/thing:12034 There’s two versions of the snowflake pattern. We’ve printed two sections that slot together, but there’s another pattern for a flat snowflake, if you want your 3d printing to be slightly less 3d. This entry was posted in Things we've made with our Makerbot. Bookmark the permalink.